You know what I love most about burgers? Their versatility. 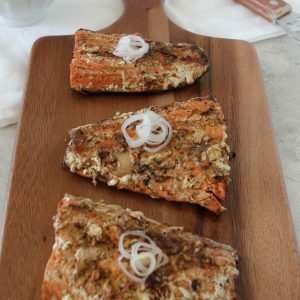 You can add whatever topping you’d like to them, adapt them to fit any cuisine or palate, bun or no bun, grilled or pan fried. Maybe you prefer to go old-school basic with some mayo, mustard, ketchup, lettuce and pickles or hipster foodie with some kobe beef, truffled aioli, skinny jeans. 😉 Either way, the choices are endless. 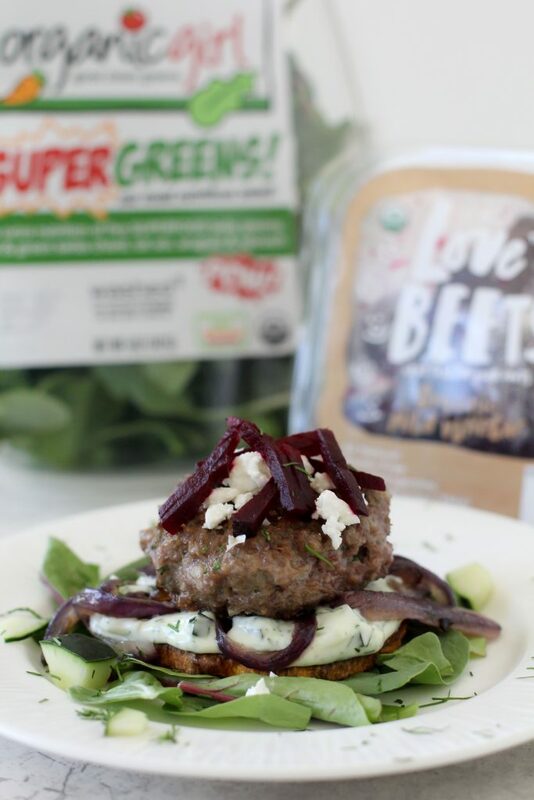 That’s why when I had the opportunity to collaborate with Organic Girl and Love Beets on their #goodcleansummerfun campaign I was so game and knew immediately I was going to create a fun burger that would be perfect for summer. I mean, what screams “summer” better than a grilled burger? 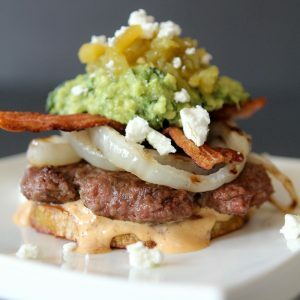 But I didn’t want it to be just any ‘ol burger, I really wanted to up the “summer” factor and include as many fresh flavors and textures as I could. 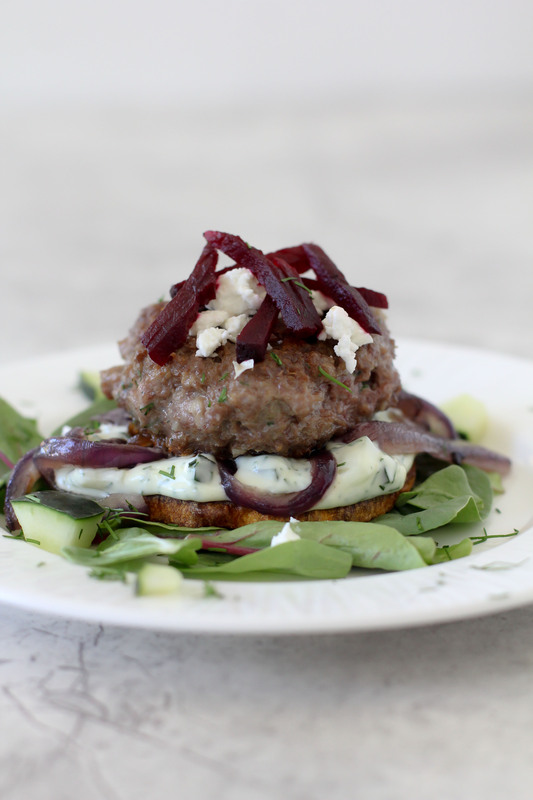 Hence, the mediterranean burger. With sweet potato “buns” of course. When I think of fresh ingredients I always think of mediterranean fair. Cucumbers, dill, olives, tomatoes, lots of grilled food, fish etc. 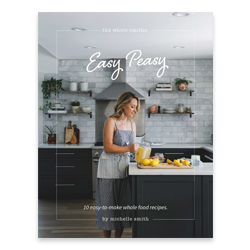 I knew it would be so easy to incorporate some of these flavors into our summer burger and I also knew that these flavors would pair perfectly with Organic Girl and Love Beets products. You can add your Organic Girl greens into the burger but I prefer to plate mine on top so I can add more greens. And since this isn’t your traditional “bun-ed” burger it works out well. 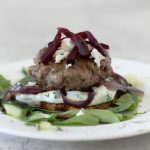 I used the Mild Vinegar variety of the Love Beets because I didn’t want to overwhelm the other flavors of the burger, the Mild Vinegar was just perfect! As far as the meat for this recipe, I went with lamb because it seemed like the clear Mediterranean choice but I know that it’s not for everyone. So if that’s the case, mix it up! You can use ground turkey or beef instead and it will still be just as delicious. As well, I added a bit of goat cheese to mine for some extra bite however if you’re avoiding dairy you can clearly leave that off. And guess what? If you leave off the goat cheese this burger is Whole30 compliant for you. 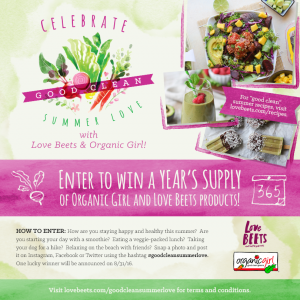 I am so stoked to be participating in #goodcleansummerfun with Love Beets and Organic Girl. 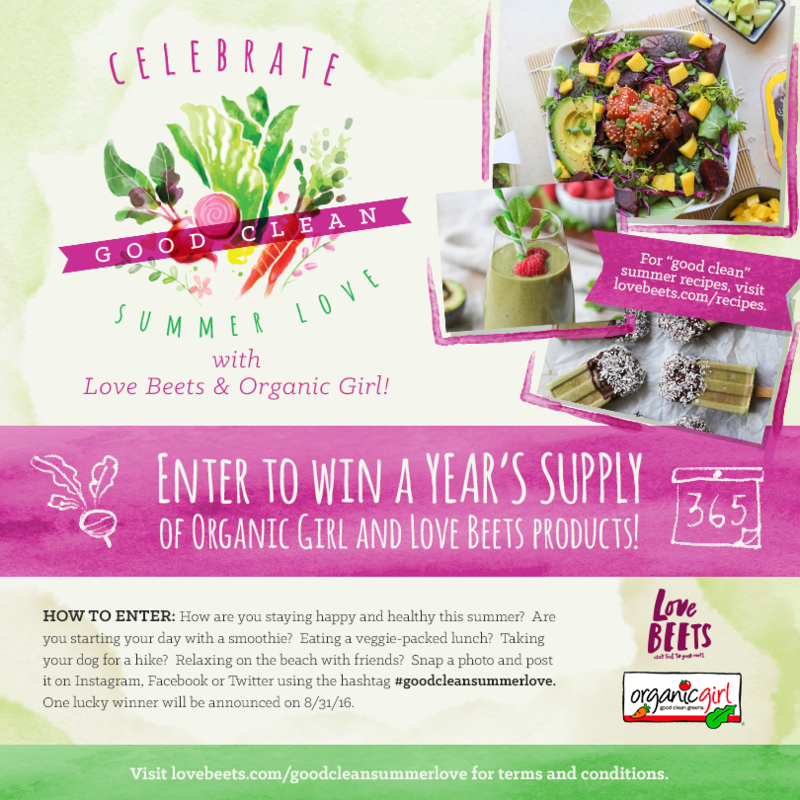 Not only do I always have their products in my fridge but they are giving someone a chance to win an ENTIRE YEAR’S supper of Organic Girl and Love Beets products. Now YOU can always have their products in YOUR fridge. How cool is that? 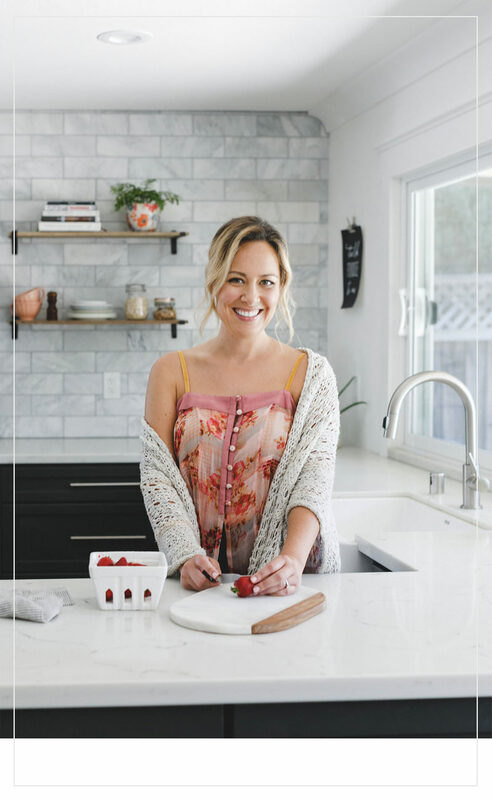 All you need to do to enter is to tag your favorite summer recipes, activities, snacks on Instagram, Twitter or Facebook with the hashtag #goodcleansummerfun. Share with us how you’re keeping happy and healthy this summer! So easy and fun to participate, go get tagging. And if you make this burger make sure to tag it #goodcleansummerfun. I hope you’re enjoying your summer as much as we are. 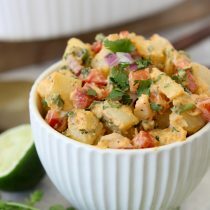 Get you #goodcleansummerfun on and enjoy this recipe! A perfect summer burger from the Whole Smiths. 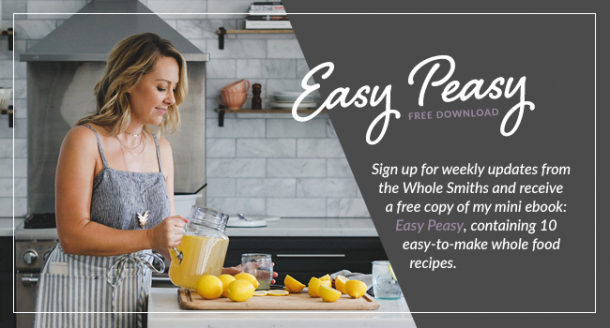 Paleo friendly and lots of fresh summer flavors. Top with additional sweet potato disc and enjoy!